Gall, Gerald L.. "Judiciary in Canada". The Canadian Encyclopedia, 30 April 2017, Historica Canada. https://www.thecanadianencyclopedia.ca/en/article/judiciary. Accessed 19 April 2019. The judiciary – collectively, the judges of the law courts – is the branch of government in which judicial power is vested. It is independent of the legislative and executive branches. Judges are public officers appointed to preside in a court of justice, to interpret and apply the laws of Canada. The Constitution Act of 1867 provides for the establishment and operation of Canada's professional judiciary. It gives the federal government exclusive lawmaking power over criminal law and criminal procedure but not over the establishment of criminal courts. It gives the provinces exclusive lawmaking power over the administration of justice in each province. The federal government appoints the judges of the Supreme Court of Canada, the Federal Court of Appeal, the Federal Court and the federal Tax Court of Canada. (The Supreme Court is Canada's highest court of appeal for all matters. The federal courts deal primarily with matters concerning the federal government). Provincial or municipal governments appoint judges of the provincial courts (the lower trial courts), as well as magistrates, justices of the peace, coroners, sheriffs and other officers of provincial courts. Provincially appointed judges deal with both provincial and federal laws and legislation. Judges do not legislate or enforce the law – that is the role of the legislative and executive branches of government and its departments and agencies. The role of judges is to interpret and apply the law in various cases. Judges interpret the intent and application of both written statutes passed by Parliament and the provincial legislatures, and they develop and apply the common law. Whether judges preside over criminal prosecutions or civil lawsuits, they must serve as impartial arbiters. The courts' impartiality flows from the essential feature of our judicial system – its independence from the executive or legislative branches of the government. Although judges are dependent on the other branches for their appointment, removal, and for the payment of their salaries, the quality of justice in Canada can only be maintained if an independent judiciary is jealously guarded. The notion of judicial independence has been tested in cases where provincial court judges have refused to rule on various cases, claiming they are not independent of the provincial government, which sets their salaries and working conditions. The Supreme Court of Canada (in the Valente case) held that the three main principles of an independent judiciary are security of tenure, financial security and independence in matters of court administration where those matters bear directly on the judicial decision-making process. There have been several cases where wage cutbacks for provincial court judges have been challenged as an interference with their independence, for the reason that it endangers their financial security. In 1981 and again in 1995, the Canadian Judicial Council released commissioned reports on the state of judicial independence in Canada (Masters in Their Own House, 1981, and A Place Apart: Judicial Independence and Accountability in Canada, 1995). The Constitution Act of 1867 and the federal Judges Act provide for the appointment, removal, retirement and remuneration (including matters such as pensions) of federally appointed judges. Most federal appointments are made by the governor general on the advice of the minister of justice and the cabinet. 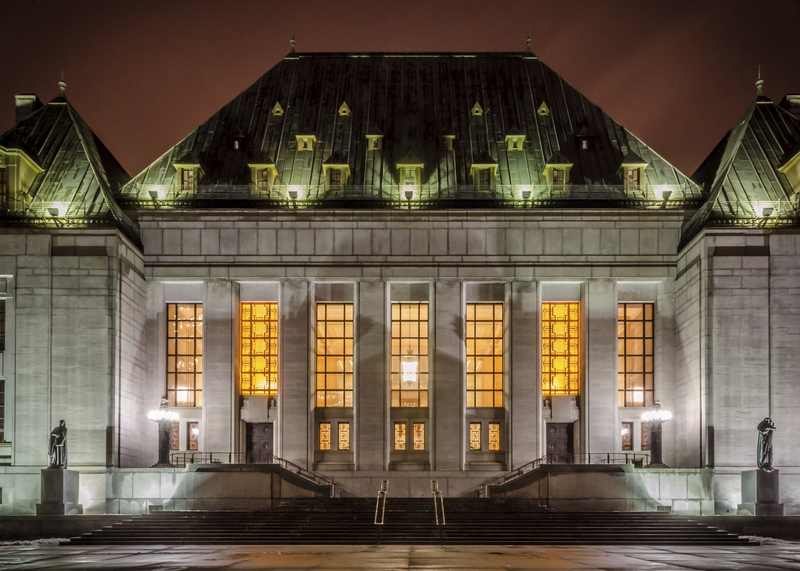 The federal government appoints judges to the Supreme Court of Canada (SCC), the federal courts and the superior courts of the provinces and territories. 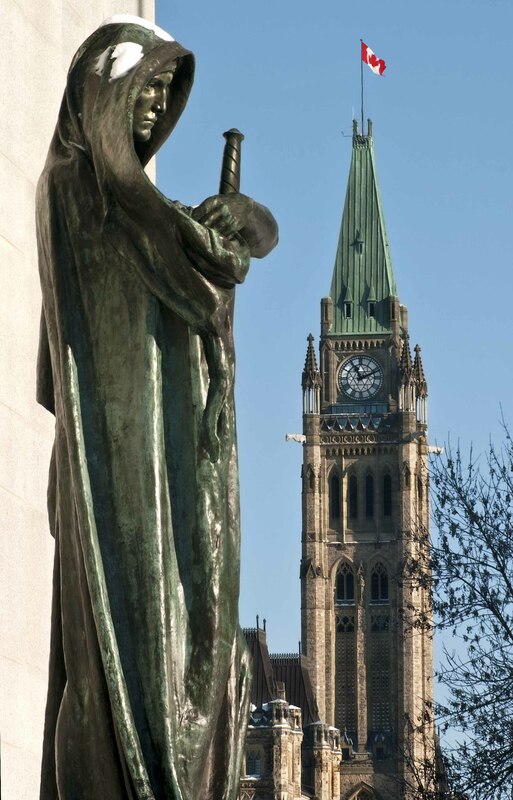 Appointments to the Supreme Court and to the various chief and associate chief justice positions of different courts in the provinces and territories, are made by the prime minister, after cabinet consultation. Since 2016, a non-partisan, seven-member advisory board has also provided a short-list of candidates for appointment to the Supreme Court, from which the prime minister appoints new SCC justices. Federal appointments to the superior and senior courts in the provinces and territories are made by the federal minister of justice, acting on the advice of a series of provincial or territorial Judicial Advisory Committees which review, rate and suggest prospective appointments. The committees are administered by Commissioner for Federal Judicial Affairs, whose office answers to the minister of justice. All candidates for federal appointments must have been lawyers for at least 10 years, and be qualified to practise law in the jurisdiction where they would be appointed. The Judicial Advisory Committees were established after major reviews of the judicial appointment process were conducted by the Canadian Bar Association and the Canadian Association of Law Teachers during the 1980s. Previously, prospective federal appointments were reviewed only by a Judicial Appointments Committee of the Canadian Bar Association. Since the 1980s the committee make-up has evolved. As of 2017, each committee now consists of seven members: a nominee of the provincial or territorial law society, a nominee of the provincial or territorial branch of the Canadian Bar Association, a judge nominated by the chief justice of the province or the senior judge of the territory, a nominee of the provincial attorney general or minister of justice, and three nominees of the federal government representing the general public. Provincial appointments are made by the attorney general or minister of justice of the province or territory, after consultation with the cabinet. In most provinces the attorney general appoints a judge only after a review of the application by a provincial judicial council (also containing a broad representation of members of the legal profession, the judiciary and the public – similar to the federal Judicial Advisory Committees). 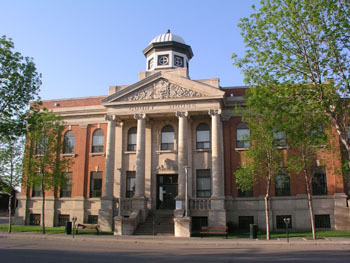 The court house at Brandon, Manitoba (courtesy Economic Development, City of Brandon). Eligibility rules for prospective judges vary among provinces. In some provinces someone must have been a member of the legal bar for at least five years, while in others they need not even be lawyers – although lawyers are almost always appointed. Many lower-level members of the judiciary, such as police magistrates, are retired members of national or local police forces. With both federal and provincial appointments, there are few requirements for judges to have expertise in a particular area of the law. This leads to examples where judges in criminal courts have little or no experience working as criminal prosecutors or criminal defence lawyers, or to examples where judges presiding over civil litigation cases have no experience as civil litigation lawyers. Some observers have called for changes to the appointments process, requiring judges to have the appropriate legal background, in order to preside over related cases. Since the 1980s, the composition of the judiciary has begun to change with the appointment of more women and younger people to the bench. In recent years there have also been calls by lawyers and legal organizations to increase the number of visible minorities on the bench, including Indigenous judges and black judges. So far there has been some progress on making the judiciary more gender-balanced. As of 2017, four out of nine Supreme Court of Canada justices were women, including the chief justice, Beverley McLachlin. Meanwhile the judges of the Federal Court and Federal Court of Appeal were roughly a third female. More than a third of all federally and provincially-appointed judges on the remaining courts were female as of 2017. 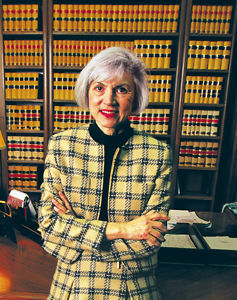 McLachlin is the first woman to head the Supreme Court of Canada (courtesy Maclean's). The judiciary remains, however, a white bastion. As of 2016 there were no visible minorities or Indigenous judges on the Supreme Court or the Federal Court of Appeal, and only a few Indigenous judges on the Federal Court. The same held true for all levels of the federally and provincially-appointed provincial level courts – with only a handful of Indigenous and visible minority judges presiding over the courts where the vast majority of the country's judicial work takes place. This is despite the fact that about 20 per cent of Canada's population is non-white. Federally appointed judges hold office until the mandatory retirement age of 75 if they are serving on the Supreme Court, the Federal Court or a provincial superior court. 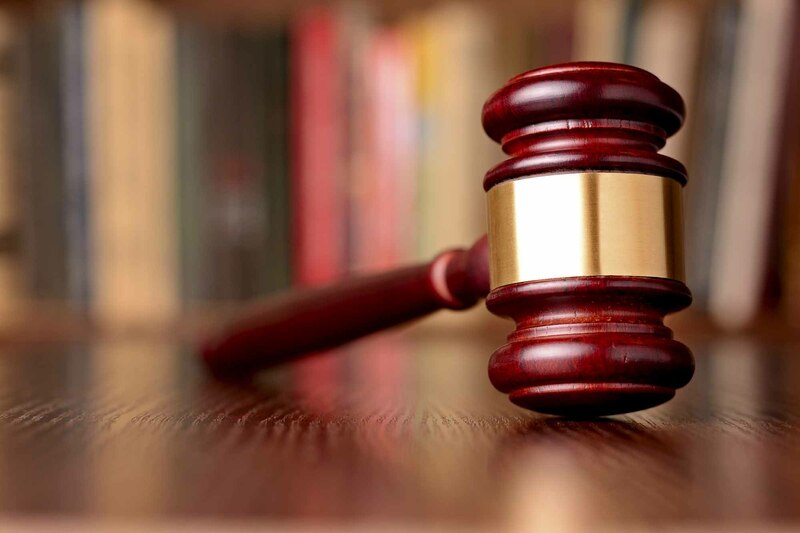 After they have served 15 years on the bench and have reached the age of 65 or more – or, in the case of superior court judges, after they have served 10 years on the bench and have reached the age of 70 – they can partially retire or go "supernumerary," sitting on cases from time to time. The retirement age of provincially appointed judges (usually age 70) is set out in various statutes creating the provincial courts. Judges are required to maintain "good behaviour" in order to keep their positions. Federally appointed judges can be removed only by Parliament, upon the recommendation of the minister of justice, following a review by the Canadian Judicial Council. Under the federal Judges Act, matters not constituting good behaviour are given broad definition to include conditions such as a judge becoming senile. The Canadian Judicial Council was created under the Judges Act. It is made up of the various federally appointed chief justices and associate chief justices of the superior courts and the senior judges of the territorial courts. It is chaired by the chief justice of Canada. The Council provides continuing education for federally appointed judges, makes recommendations to the minister of justice following the investigation and review of judges' conduct, or of complaints against them. It also recommends, when appropriate, a judge's removal. As of 2017, the Council has only twice recommended the removal of a judge. But Parliament has never taken the next step of removing a judge, because those facing removal have resigned before the impeachment process is complete. Similar but varying guidelines for judicial behaviour exist for provincially appointed judges. Some provincially appointed judges have been removed by an impeachment process which in certain provinces follows investigation and review by a provincial judicial council similar to its federal counterpart. Provincially appointed judges have been disciplined or removed for the commission of a crime and for moral turpitude. The reasons for judicial appointments – how and why individuals are chosen to become judges – have always been surrounded with secrecy, which fuels the belief that political considerations influence the appointments. It is widely held that to become a judge it helps to be politically connected with the political party in power, or that some judges get their positions and promotions as patronage favours from the party in power. A person should not be disqualified from a judicial appointment because of past political affiliation. This matter became the subject of public debate during the 1984 federal election following a spate of patronage appointments by the outgoing government. From the early 1970s until 1984, all federal judicial appointments were externally reviewed by the Judicial Appointments Committee of the Canadian Bar Association. This review served as a buffer against the use of judicial appointments as political patronage. This procedure was not followed in a 1984 appointment. The controversy that followed led to major reviews studying the appointments process, and the subsequent changes that led to the system in place today. The present process, however, does not guarantee that appointments are immune from politics. This is because final appointments are made, from a list of reviewed and approved candidates, by the minister of justice (or, in some instances, by the prime minister) after consultation with the cabinet. Generally, the appointment process is far less politicized now than in the past. This is especially true of appointments to the Supreme Court. On the other hand, other non-political factors have entered the appointment process (such as gender, language, geography and ethnicity) in an effort to ensure that the judiciary consists of qualified persons who reflect the nature of Canadian society. Most newly appointed judges are persons trained and experienced in the law. A great deal is expected of them by society, yet they possess no superhuman qualities. In return for special legal and ethical constraints imposed upon them, society provides them with status, prestige and trust. Because they are also entrusted with the responsibility of adjudicating personal, sensitive, delicate and emotional disputes – as well as resolving the major social, economic and occasionally political issues that arise in some legal contexts – the judiciary helps mold the social fabric governing our lives.